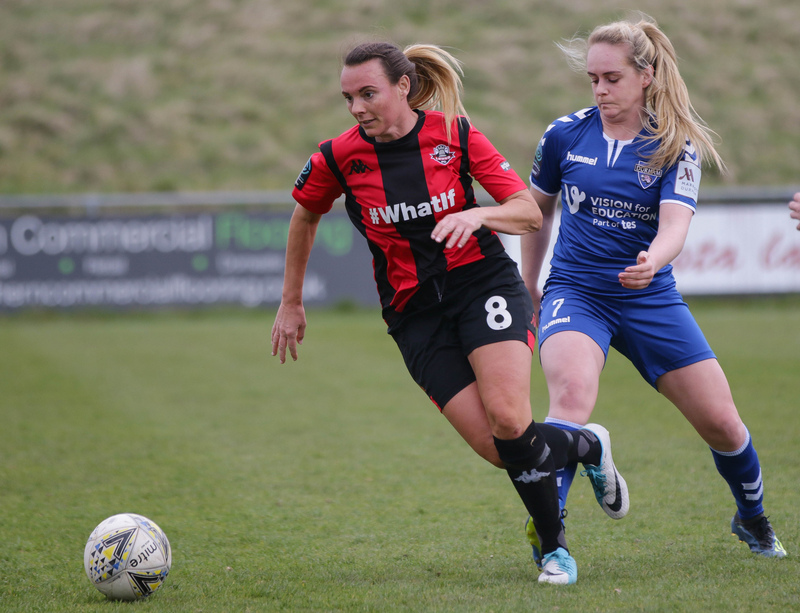 Lewes manager Fran Alonso was frustrated and proud in equal measure as he watched his vastly-improved side miss a series of chances to beat one of the best sides in the FA Women’s Championship, only to fall to a sucker-punch on the stroke of half-time. After a bright start, with Abi Cottam and Emily Roberts taking the game to Lewes, the visitors, third in the league before kick-off, found themselves forced to defend for much of the contest. Lewes, driven forward by an inspired Leeta Rutherford, found their passing rhythm and created a host of chances to take the lead. Kiwi International Katie Rood caused problems on the Lewes left, breaking at pace and linking well with Jess King and Dani Lane. Lane, working hard on the right, got in behind Hannah Greenwood. Her ball in found King in space but, instantly closed down, her early shot was blocked. Academy graduate 17-year-old Ella Newman, making an impressive first-team debut, picked up the loose ball on the left and drove at the Durham defence only to be forced wide by the excellent Kathryn Hill. 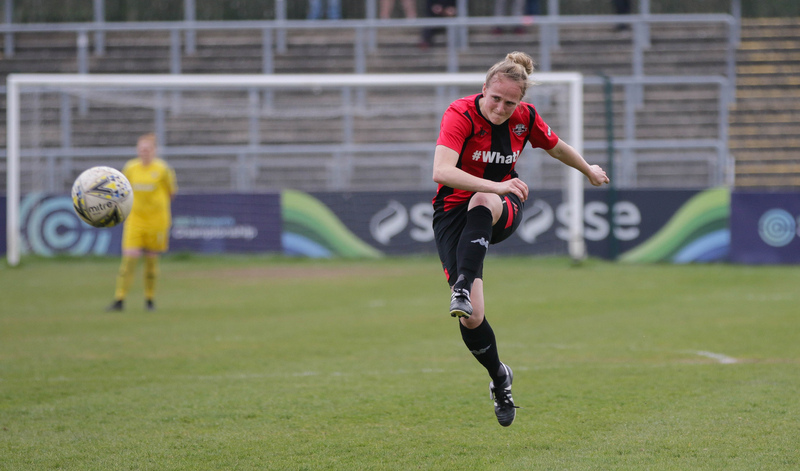 Roberts countered, testing skipper Kate McIntyre’s hamstrings, Lewes ‘keeper Faye Baker alert to her early shot. Rutherford won the header from the clearance, finding Kempson whose shot was blocked. Rutherford collected, danced through a series of challenges before she found King but the assistant’s flag spared a scrambling Durham defence. Rutherford once more, this time with a searing cross-field pass to pick out Rood, but again Durham’s impressive work-rate ensured the final ball was forced wide. Referee Steven Hughes felt obliged to speak to Rutherford and Durham’s Beth Hepple after their fierce midfield battle threatened to cross the line, yet as competitive as the match was it was played in an excellent spirit. On the half-hour, Lewes should have taken the lead. Kempson popped up inside right, side-stepped a tackle and slipped a delightful cross into the six-yard box. King out-jumped her marker to head past Hannah Reid only to see the ball rebound off the crossbar. Kempson saw a fierce drive from 25 yards fly wide, Nicki Gears responding in kind for Durham, her shot flying high into the Ham Lane end. It was to be a warning for Lewes. Moments after a Kempson free kick was parried following a foul of Sammy Quayle, Rosie Paye’s follow-up shot was gathered by Reid. Her quick clearance was flicked on for Gears to chase. Gears by name, gears by nature, the Durham nine raced onto the ball just ahead of Charlie Boswell and the recovering Paye. Baker came out to narrow the angle, but Gears kept her cool to slot home. 0-1. HT. Durham emerged for the second half a different side. 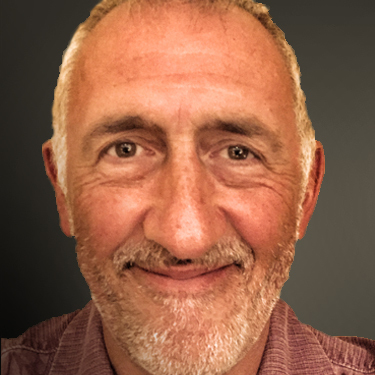 With Lewes having dominated possession and chances in the first forty-five, Lee Sanders’ instructions were clear; don’t let them play. The Wildcats lived up to their name, closing Lewes down, pressing high. Lewes struggled to get out of their own half for ten minutes, taking their turn to put on a solid defensive display. Lewes finally broke out, inevitably through Rood who set up Rutherford, her left-foot strike running wide. Fran Alonso made a double change on 74 minutes, bringing Sophie O’Rourke and Charlotte Owen on for Boswell and Lane. The next chance, however, fell to the visitors when a cross-shot rebounded off Baker’s bar. 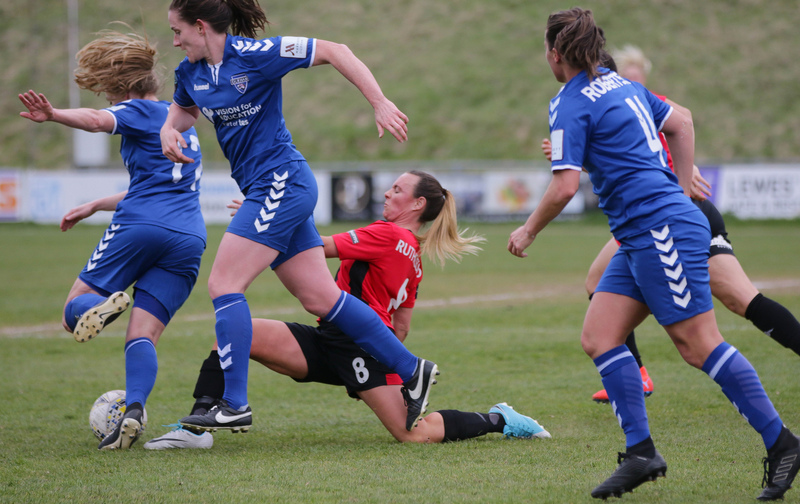 Lewes hearts were in mouths as Baker played an early ball that was picked off by the alert Roberts, her attempted lob met two-handed by Baker to yield a corner, one of three in quick succession that Durham conspired to put out on the full. Newman pushed forward to set up Rood, the blocked ball falling to Owen whose shot in turn was blocked by a blue shirt. The next Lewes effort was a familiar one. Kempson, struggling to find space all afternoon, stole a yard. She shifted onto her left foot, stepped inside and unleashed a superb drive that left Reid stranded and took a layer of paint off the upright as it flashed wide. At last, Durham players started to show signs of fatigue, a series of fouls, clumsy rather than malicious, a tell-tale sign. Yet another on Jess King created another chance for Kempson. Her left-foot strike from 25 yards fell to Owen on the edge of the six-yard box. Her turn and shot was blocked by a wave of blue shirts sliding in from the left. Cries for a penalty as Quayle appeared to be felled in the melee floated across the Convent Field as the referee waved play on. FT 0-1. After the match Alonso expressed a mixture of pride and frustration. Newman-Lewes Academy player Newman was delighted to get her chance in the first eleven. 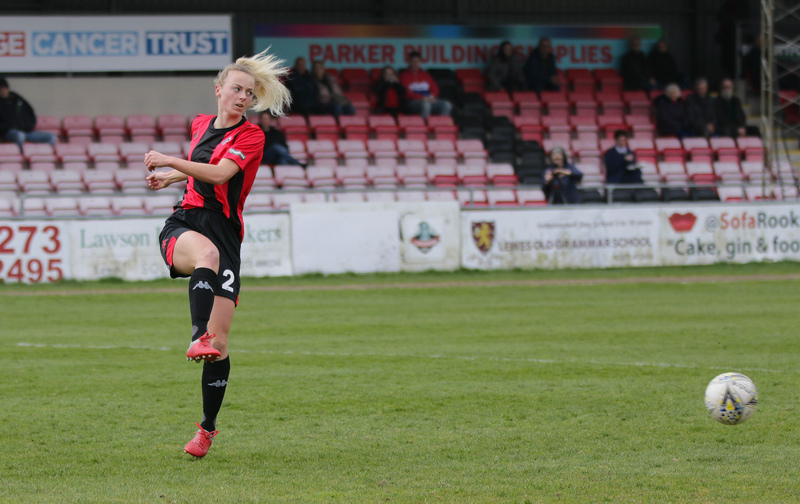 MvP: A number of Lewes players were in good form but Leeta Rutherford was on another planet in this one. She covered every blade of grass and showed a real hunger for the ball. Some of her lay-offs and interceptions were out of the top drawer.